Over the past decade or so, marketing has turned into much more of a science than an art – with every marketing effort, channel and dollar spent meticulously measured through a wide variety of digital marketing platforms. A marketing dashboard is a visual reporting tool that allows marketers to evaluate in real time their campaigns' performance and progress. A thoroughly thought through marketing dashboard can potentially save your marketing department a lot of time and money. 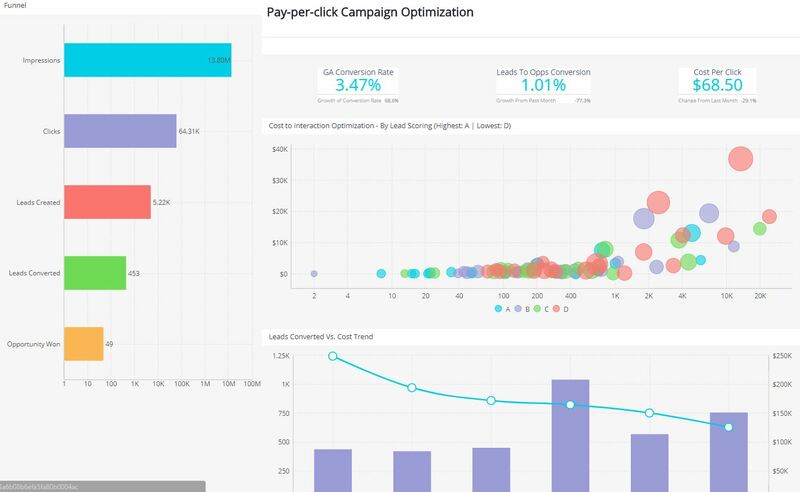 This marketing dashboard example shows how organizations can use interactive reporting to gain a better understanding of their marketing KPIs spend and results, and to employ data-driven methodologies to ensure these efforts are clearly tied into ROI.